Crowdfunding extended due to new survey results. Britannia’s Gold is pleased to make public the latest results from our initial survey campaign – Triton. When analysing the results using state-of-the-art technology, the team has found clear indicators of Gold on board the wrecks. This new data is of course great news for public investors already committed via angeleqt.com. After careful deliberation, BGL Management has decided to extend the crowdfunding activity another month to let the public react to this new data being made available. 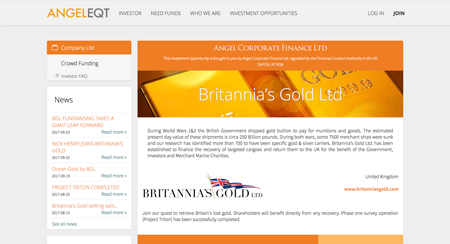 Become a shareholder in Britannia’s Gold Ltd! You still have the chance to become a shareholder in the greatest ever gold recovery in history. Our crowdfunding offer is now extended until Tuesday October 31st. Go to WWW.ANGELEQT.COM to make your pledge. Salvage operations to start soon! We are delighted to also share that we will begin the recovery phase of our operation in early October to begin salvaging gold and non-precious metals.